Coach Chris Maloney has been a minor league manager for 18 years. The last 7 years he was the 1st base coach for the St. Louis Cardinals. Coach Maloney has been giving hitting lessons here since we opened in 2012. Call to get lessons from the best hitting coach around. The Madison County Sports Zone is proud to announce that former ole miss & MBL pitcher Cody Satterwhite is now giving pitching lessons at the zone!!! Call to book with Cody!!! Seth Loman played 10 seasons of professional baseball. Seth has been with us 2 years and coaches two of our teams. Call today to schedule a lesson with Seth! Kent Willis spent 16 years in the Atlanta Braves minor league system, coaching pitchers and running the pitching program for all of the Braves minor league teams. Kent has been with us for 4 years and there is nobody better for pitching lessons around. He also worked with Garrett during the off season while he was home. Call today to schedule your lesson with Kent. Hitting, Fielding and Pitching . Madison County Sports Zone’s 4th Annual Co-Ed T-Ball/Coach pitch league will begin on January 5th with a parent’s meeting and practice. The games will be played inside the Sports Zone on Saturdays starting January 5th, 12th, 19th, 26th, February 2nd and 9th. The cost is $150 and includes a jersey. We will have 2 divisions this year………3 and 4 year olds will play t-ball and 5 and 6 year olds will play coach pitch. Please call or email to sign your child up and give us their jersey size. 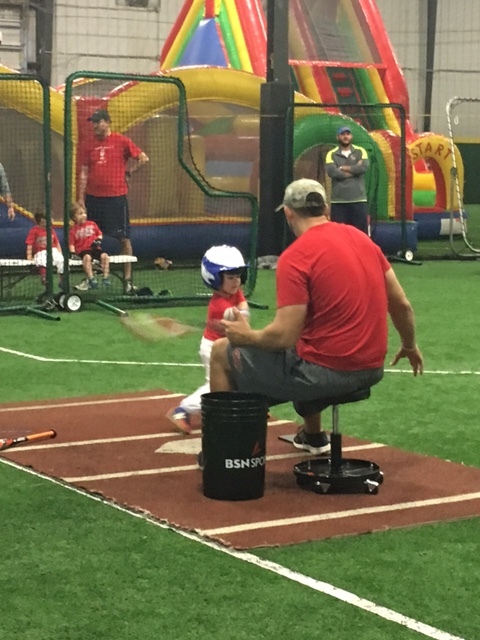 Monday and Wednesday 5:30 p.m. – 7:30 p.m.
Our facilities include 14 batting cages, 4 dirt pitching mounds, 4 turf pitching mounds, 1 90 foot Indoor Baseball Diamond or 2 indoor baseball practice fields, and 1 outdoor field with a 90 foot diamond . Our pitching machines include 2 iron mike pitching machine, 2 of Atec’s arm throwing machine, 2 Atec Casey Pro 3G, 1 Atec softball pitching machine, 1 hack attack pitching machine, and 1 small ball pitching machine.